Feature walls are trending, and it’s not hard to see why! If you are looking for an easy, non-expensive way to liven up any part of your home, a feature wall could be your best bet! You get to experiment with colours, patterns and materials, and inject just the right amount of interest in a room, without being too overwhelming. How To Choose A Feature Wall For Your Home! Choose a prominent area that people would naturally look at when entering the room such as a fireplace or a TV. If you have a protruding wall in the living area, then that can be used as a feature wall. Walls behind a unique piece of furniture/ mantelpiece can also act as feature walls. Say one behind a well-embellished sofa set would add accent to the sofa. Feature walls should steer clear from overcrowded furniture so that it gets appropriately highlighted. Avoid windows in-between a feature wall. In case of open concept areas in modern apartments, feature walls can be used to carve out spaces and demarcate between living and dining spaces. A Few Feature Wall Ideas You Can Choose From! Wallpapers emerged in the European Middle Ages, predominantly made of textiles like silk tapestries or wool. However, as these were costly, wallpapers came in as a cheaper alternative catering to the masses. Later, printed rice papers from China called chinoiseries became a craze. Today, there are umpteen number of options to choose from with different materials textures and designs. Before buying wallpaper, it is wise to obtain a sample. Samples are inexpensive. You can pin it on the wall to see how it looks on the space during day and night. If you do not want to commit the entire wall to wallpaper, go in for embellished borders. These are also helpful in hiding any imperfections on the top portion of the wall. Tiles come in peel and stick options sans wallpaper glue. These are ideal alternative for small accent walls huge wallpaper rolls. Removable wallpapers come down easily sans harsh chemicals and suits frequent wall makeover.Washable wallpapers make cleaning a natural process. Choose the proper material like vinyl, paper, wood, fabric, grass cloth, etc. to gel with the furniture in the room. Opt for metallic or textured wallpapers to make a feature wall pop up and stand out. Paint is a traditional but exciting way to jazz up a feature wall. Choosing the right color that complements with the other walls is essential. For instance, if the walls have a neutral color, then a darker contrasting shade would go well. For bright walls, a few shades darker or lighter would work well. One can also add various effects like lace, stripes, stencils, etc. This technique adds sheen to a feature wall giving the look of a glossy marble wall. Walls using this technique can also be made durable for baths and kitchens using wax or soap sealer. Silk panels are another excellent option for feature walls for that rich royal look. They can come in various colors and rich jewel tones. How about carving illuminated niches in the feature wall with sculptures to give that gallery feel. A treated feature wall is another exciting option worth trying. They also aid in dampening the sound. Wood paneling was famous centuries back in Europe where it began as a simple paneling done in the doors of classic Italian roman interiors. Later during the Gothic period, it was popularly used on walls. For creating a more open space feel opt for lighter colors. Striped wood panels give a modern look, while grasscloth panels in striped wood gives that luxurious look. Tufted feature wall panels are interesting alternatives to regular feature walls. They bring home a whole world of benefits beyond just aesthetics. They not only brighten the interiors but also act as a perfect acoustic shield. A media or home theatre room can significantly benefit from a tufted wall as it can eliminate noise and prevent echo in addition to keeping one cozy and relaxed. A map wall is a quirky way to highlight a feature wall. Maps can be vintage, historical, regular or pictorial maps with stickers. The choices are endless. How about bringing in a unique statement of style with tile feature walls. For more sophistication go for architectural tiles, geometric or herringbone designs. 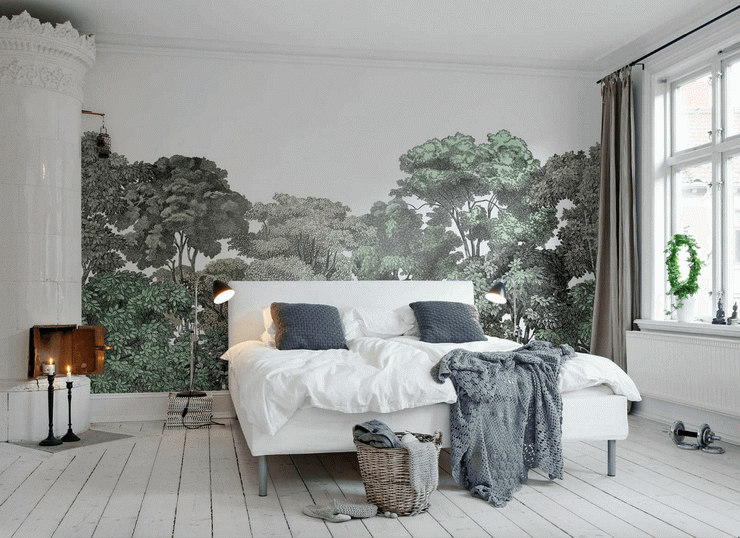 Wall stencils are another great affordable alternative to wallpapers. 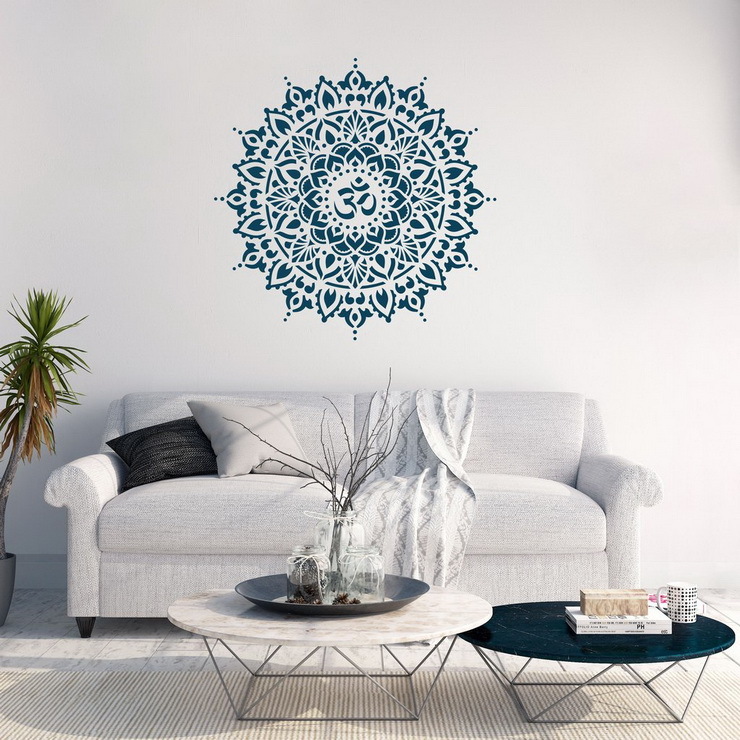 Unlike wallpapers, these are not harsh and do not hurt the wall surfaces and hence can be repainted if you decide to change the home décor style. One can never go erroneous with the classic brick feature wall. You can add soft metallic paints, a pop of color on the wall or leave it plain red. Brick walls add personality to space. Want to fly back in time to the stone age? Well, you can come closer to your dream with stone accent walls. They are not only unique but also add a touch of a natural element into your living spaces. Set the mood with pebbles or natural stone elements. Fabric art wall, Bookcases that rise to the ceiling, or an art gallery wall are good options for those who don't want to commit to a permanent feature wall color. Hanging a huge interesting picture or clock will also help to accentuate the feature wall. Feature wall in a bathroom can make it more pleasant and attractive. Go in for unique waterproof wallpapers or jazz up the wall with beautiful mirrors. A tufted accent wall in a bedroom can double as a headboard as well. Feature walls can add accent to staircases as well. This reclaimed weather wood feature wall beautifully rises along with the stairs giving it a vivid look. Who said feature walls couldn't rise to the ceiling. Ceilings often called as the 5th wall are being used as feature wall of late. If the walls in the room are made up of lots of huge windows, then it is wiser to choose the ceiling as an accent wall. So go ahead paint the ceiling and make your home look up!! If you are looking for experts to design your home, get in touch with Hipcouch today! Newer PostWant To Use Marble In Your Bathroom? Here's The Guide You've Been Looking For! Older PostCan You Really 'Handle' A Handle-less Kitchen? Here's What You Should Know!